An examination of three major figures, each of whom saw profound connections between the operations of computers and those of parts of the physical and/or biological world, looking for commonalities and differences in their views. Mathematical version (first version): In any consistent formalization of mathematics that is sufficiently strong to define the concept of natural numbers, one can construct a statement that can be neither proved nor disproved within that system. Also sat in on Ludwig Wittgenstein's 1939 lectures at Cambridge. Wittgenstein (along with his teacher Bertrand Russell one of four or five most important 20c philosophers) had earlier believed strongly that mathematical and logical truth captured everything about human experience, and was now growing to doubt that view just as strongly; Turing argued essentially that the earlier Wittgenstein's views were correct. "Prosecution of Turing for his homosexuality crippled his career. In 1952, his male lover helped an accomplice to break into Turing's house and commit larceny. Turing went to the police to report the crime. 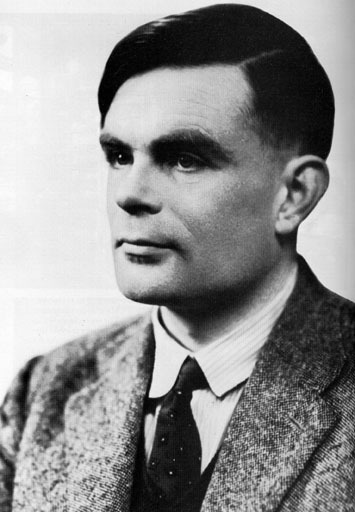 As a result of the police investigation, Turing was said to have had a sexual relationship with a 19-year-old man, and Turing was charged with 'gross indecency and sexual perversion.' He unapologetically offered no defense, and was convicted." "Following the well-publicized trial, he was given a choice between incarceration and libido-reducing hormonal treatment. He chose the estrogen hormone injections, which lasted for a year, with side effects including the development of breasts during that period." C: Will X please tell me the length of his or her hair? "My hair is shingled, and the longest strands are about nine inches long." In order that tones of voice may not help the interrogator the answers should be written, or better still, typewritten. The ideal arrangement is to have a teleprinter communicating between the two rooms. Alternatively the question and answers can be repeated by an intermediary. The object of the game for the third player (B) is to help the interrogator. The best strategy for her is probably to give truthful answers. She can add such things as "I am the woman, don't listen to him!" to her answers, but it will avail nothing as the man can make similar remarks. Turing appears to believe that a digital computer can in fact do all the things called "thinking"
Born Dec 28, 1903; Died Feb 8, 1957. 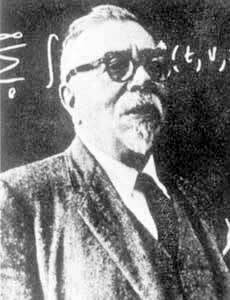 Last name pronounced "von Noimann"
Contributed to mathematics, quantum physics, set theory, computer science and economics; one of founders of fields of "game theory" and "theory of cellular automata"
One of the first efforts to develop a way of thinking in which human beings and machines could be "thought together"
Origin of use of cyber- as prefix indicating something like "computer-related"
What is shared in Wiener's views on cybernetics and Turing's views on morphogenesis? What has become of cybernetics in contemporary thought? Have computers achieved the test Turing set for them? Have computers lived up to Wiener's expectations, and/or his fears, for the interactions of human beings and machines?